Good Life Solutions has developed the best answer to life's messy path that results from daily life with kids and pets. You will probably reach for this product more than any other. This plant-based kid and pet odor eliminator is a safer solution to tackle a wide variety of stains and eliminate the inevitable smells that go along with them. Life with kids and pets is a full contact sport, not for the faint of heart, so let's get after the nitty gritty side effects that seem to happen no matter how careful we try to be. Here we go: POOP, PEE, SLOBBER, DROOL, VOMIT, BLOOD, SWEAT, JUICE, FOOD, OR WHATEVER COMBINATION OF ORGANIC WASTES YOUR FAMILY COMES UP WITH. Good Life Solutions has you covered with this Professional Strength Bio-Enzymatic Stain and Odor Remover Spray. Directions: Carpet, Upholstery & Fabric: Apply product to the problem area. Saturate with enough product to penetrate deep into the fibers. For carpets, make sure you saturate the padding too. Gently work product into a lather to remove the stain. Let it work for a few minutes or until stain is gone. ALWAYS USE A BLOTTING MOTION TO REMOVE STAINS. For set in stains, repeat. Keep the stained area wet with the spray till the stain is gone, allow the area to dry naturally. At Good Life Solutions, we strive to help you, your family and your pets Live The Good Life!  HAVE YOU BEEN WAITING FOR A VERSATILE STAIN AND ODOR REMOVING PRODUCT YOU WILL RELY ON MORE THAN ANY OTHER CLEANING PRODUCT IN YOUR ARSENAL? THINK: mattresses, carpet, upholstery, fabric, tile, water-safe hard flooring, concrete, pet beds, pet crates, pack and play mattresses, baby crib pads, infant and child car seats, automobiles, RVs, boats, yoga mats, athletic gear, diaper changing tables, diaper caddies, machine washable laundry and so much more.  LOOKING FOR A SAFER, NATURAL, NON-TOXIC ANSWER TO THOSE INEVITABLE STAINS THAT HAPPEN WHEN YOU LIVE WITH KIDS AND PETS? Good Life Solutions has formulated a superior product that actually eats away organic stains and the odors that go along with them. This is not harsh chemicals and eye watering fragrance but a Bio-Enzymatic Solution with a gentle scent that actually works. Keep the problem area wet with the spray until the stain is gone. Allow the area to dry naturally and presto, no stain.  ARE YOU READY FOR A STAIN AND ODOR REMOVER THAT IS RELENTLESS AND RELIABLE? This bio-enzymatic formula removes stains and odors from POOP, PEE, SLOBBER, VOMIT, BLOOD, SWEAT, DROOL, JUICE, FOOD, OR WHATEVER COMBINATION OF GROSS ORGANIC WASTE YOUR FAMILY COMES UP WITH. We are a family owned company and we put it to work on our busy home on a daily basis. There is no organic stain our family hasn't produced and it hasn't failed us yet! See what it can do around your home, boat office etc.  HAD ENOUGH OF SMEARING AROUND CHEMICALS AND FRAGRANCES THAT ONLY MASK THE SOURCE OF THE PROBLEM? Unlike other standard chemical cleaners, our formula utilizes a plant-based surfactant that devours the substance that made the stain and takes the smell with it. We developed this plant based product to be tough where it needs to be and gentle on the environment we live in.  TIRED OF USING A CLEANING PRODUCT THAT LEAVES YOUR HOUSE SMELLING LIKE FAKE FLOWERS OR A HYPER-SANITIZED HOSPITAL RESTROOM? 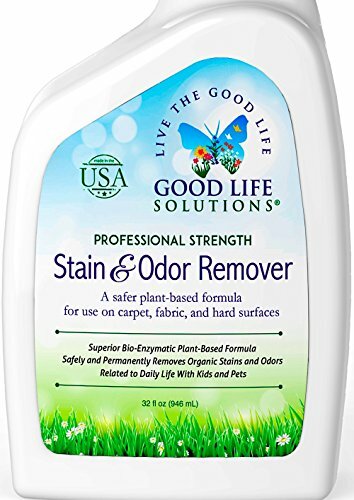 Good Life Solutions has created a whole new opportunity for you to defeat the stains and odors associated with daily life, and leaves behind a subtle hint of just plain clean. Our earth safe formula is the best choice to use all around your busy home to ensure a safer environment for your whole family and your pets. If you have any questions about this product by Good Life Solutions, contact us by completing and submitting the form below. If you are looking for a specif part number, please include it with your message.